The "Monty Hall Problem" in statistics comes from the old TV game show Let’s Make a Deal. In the game, Monty asks you to guess which door a prize is hidden behind. This problem is interesting because the solution is so counter-intuitive that it's tripped up some of the world’s leading mathematicians! In fact, this problem's mind-bending quality reminds me of the nature of optical illusions. I’ve always been fascinated by optical illusions because some of them remain very compelling even after you know the truth about them. 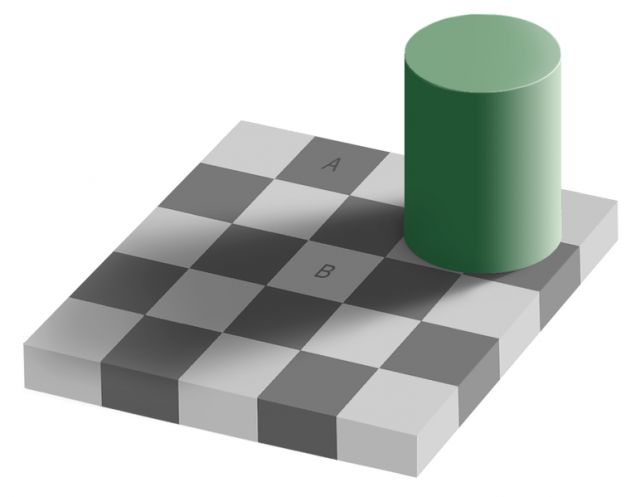 For example, even though I know square A is the same shade of grey as square B in the picture below, that still doesn't appear to be the case! Optical illusions occur when the default algorithms your brain uses to process visual data produce results that don’t match reality. To see through the illusion, you have to carefully deconstruct the image so you can bypass your mental defaults. The Monty Hall Problem holds the same fascination for me. It’s a statistical illusion that occurs because your default mental algorithms for assessing probability produce results that don’t match reality. As with an optical illusion, this illusory perception can feel more real than the true solution. In fact, many people want to reject the true answer to this problem when they first learn it. Let's explore the Monty Hall Problem and deconstruct it like an optical illusion in order to reveal the truth. We'll also learn an important statistical lesson, too, because resolving this problem highlights the importance of verifying the assumptions behind any analysis! Monty Hall asks you to pick one of three doors. A prize is behind one door and no prize is behind the other two. You choose a door, but you can’t open it yet. Monty then opens one of the remaining two doors, and there is no prize behind it. At this point, two unopened doors are in play: the door you picked and the remaining door you didn’t pick. The prize is behind one of those two doors, but you don’t know which one. The Decision: What Door Should You Choose? If you’re like most people (including the noted mathematicians), you’ll assume that the prize is equally likely to be behind either door. Since it appears to be a 50/50 choice, most people stick with their original pick. They see no reason to change. But now the counter-intuitive nature of the problem raises it head! It turns out that the prize is not equally likely to be behind either of the remaining doors. In fact, if you switch, you’re twice as likely to win! Marilyn vos Savant was asked this question in her “Ask Marilyn” column in Parade magazine. She answered that the player should switch in order to have a 2-in-3 chance of winning. The answer was so unbelievable that she received 10,000 letters saying that it was impossible! In fact, 1,000 letters came from readers with Ph.D.s! One of them was Paul Erdős, a noted mathematician who was convinced only after seeing the results of a computer simulation. So, are you thinking that it’ll be difficult for me to show you the solution? Not really, I can do it in the small table below. The only math skill that you’ll need is the ability to count to 6! In the table, the first row indicates that you picked door 1 and the prize is actually behind door one. Because the two remaining doors don’t have a prize, Monty can show you either of those two and the outcome is the same. If you don’t switch, you win. If you switch, you lose. In the second row, you again pick door 1, but the prize is actually behind door 2. Monty can only show you door 3. Of the two doors that you didn’t pick, door 3 is the only one that doesn’t have the prize. If you don’t switch to door 2, you lose. If you switch, you win. And so on; the table shows all of the possible scenarios. All we need to do is count up the number of wins for switching and for not switching. As you can see in the tally, you’re twice as likely to win if you switch! After this empirical demonstration, I hope you’re on board with the idea that you are twice as likely to win if you switch doors. But why does it work out like this? The key to understanding this solution lies in understanding why our intuition is screaming—incorrectly—that the probability should be 50/50! We need to see through the statistical illusion. We are used to probabilities based on independent, random events, such as flipping coins or rolling a die. In those cases, we simply divide the specific outcome by the total number of outcomes. For example, the probability of getting a head on the coin is 1/2, or 0.5. The probability of rolling a 1 on a die is 1/6, or 0.166. So, it seems logical that when you are down to two doors you have a 50/50 chance, rather than the true 33/66. However, you must satisfy certain assumptions in order to use this procedure to calculate the probabilities. Specifically, the process must be random and the probabilities must not change. The Monty Hall Problem violates both assumptions. Your initial choice is the only random part of this process. 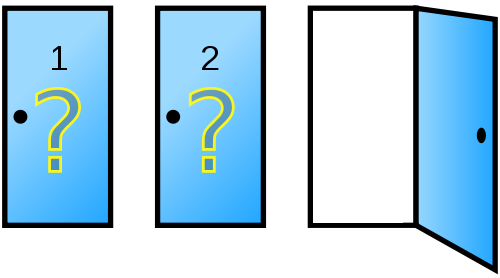 You pick one of three doors, and you have a 0.33 probability of choosing the correct one. Look at the “Don’t Switch” column in the table and you’ll see that the table confirms this with wins 33% of the time. Random probability only applies up to this point. However, once Monty starts using his insider knowledge of the prize's location, the process is no longer random and the probabilities are no longer constant. Monty knows where the prize is and, very selectively, he only opens a door that does not contain the prize. The end result is that the door he doesn’t show you, and lets you switch to, has a higher probability of containing the prize. Here’s how it works. By the process of elimination, the prize is behind the door that he doesn’t show you! Notice how the process is completely deterministic after you make your initial random choice? If you chose the incorrect door, the prize must be behind the un-opened door that Monty offers you. Because you’ll pick the wrong door two-thirds of the time, the prize must be behind the door that Monty offers you two-thirds of the time. This is borne out empirically by the “Switch” column in the table where the winning percentage is 66%! I hope the rationale for switching doors is more apparent after this explanation. The counter-intuitive outcome happens because Monty uses his insider information to affect the results in a non-random manner. And as promised, there is also a larger statistical lesson here. In the field of statistics, we often remind you to check the assumptions for the specific test or model you are using. This applies to everything from checking the residuals for a regression analysis to checking the distribution of your data. If you don’t satisfy the assumptions, your results may be incorrect. In this case, our original mental model was one of independent, random events. However, that is an incorrect model for the Monty Hall Problem. Only the initial choice among the three doors follows this model. From that point on, the events are highly dependent and not random. And that’s why our intuition was wrong! In statistics, checking the assumptions of the analysis is your key to escape the trap of illusory results! But, don’t feel bad...even Ph.D.s fall prey to this potential trap!